Regardless of equipment…. you capture the best! Hi Andrew – so funny I almost sent you a note today as I was a bit worried I’d not seen you posting. So happy to see you back! 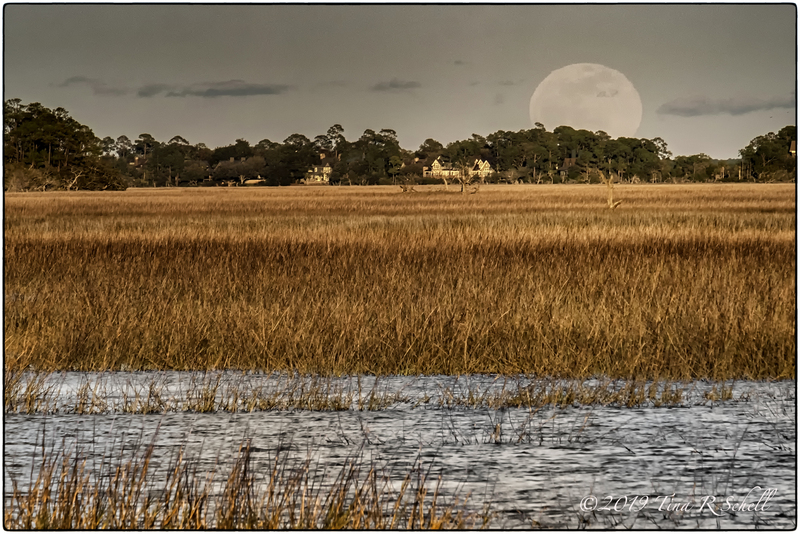 That was a big moon rising above the marsh. Thanks Pauline, it was indeed! Thanks Jo, glad you enjoyed these. It was quite a stunning event. These are fabulous photos. Unfortunately, for the blood moon we were clouded over. Thanks Amy. We were very lucky this time around. The forecast was lousy but the skies cleared just in time! Sometimes that’s the best way to enjoy natural phenoms Cornelia! I felt that way for the solar eclipse. No photos but an amazing experience despite the clouds. Hi, Tina. I love the blood moon shot! I’m also interested to read about how you’re considering switching from Nikon to Fujifilm. I’ve had Canon full-frame for some years now and it’s a great system, but oh my, it’s heavy and bulky. I recently picked up a small compact Fujifilm X70 and it’s been a revolution in (lack of) weight, portability, and image quality. It’s made me think about a possible change to Fujifilm sometime in the future, although it’s hard now to think about that given my investment with Canon lenses. Thanks Henry. Re the equipment change, I have the same issue. Been shooting Nikon for a very long time, lots of $$ in my lenses but at the end of the day if they’re too heavy for me to use the way I want to, a change has to happen. At this point it’s either invest in a new Nikon body and suffer the lens weight or move to a new platform. I chose the latter and am very pleased with the flexibility and portability of the Fuji. As good as my DSLR? No but much more useable and very, very good! Yes, I agree. I’m happy my Fuji makes great pictures, and while I like many like RAW, I also like the appearance of Fujifilm colours in the straight-to-JPG option. Even though it takes up a minor fraction of my overall photography at present, what I sometimes worry is having the capability, trust, and options under (very) low light and no-flash conditions. That’s one of my favorite things about the Fuji – it’s terrific in low light. Much better than my Nikon. I didn’t even purchase a flash! Some time ago, I had a chat with a staff member at a local camera shop, and apart from their “art of the sell”, they convinced me that Fuji’s line of mirrorless cameras includes hardware for low-light capabilities. Naturally that’s for me to find out. If I switched, I’m certain my new complement would be much lighter on the whole, but still on the bulkish side which can’t be helped. Tina, such wonderful images. So happy to be able to enjoy the beauty of the moon and surrounding landscape through your picture!! It looks like you were in the perfect place to get some great photos of this event! Thanks Nora – we took the scientific approach for moonrise but the full-on-red moment was visible pretty much everywhere! I meant to comment much earlier today, but my tablet was acting up. I love how you themed the moon as the unexpected, Tina, and your images are so pretty. 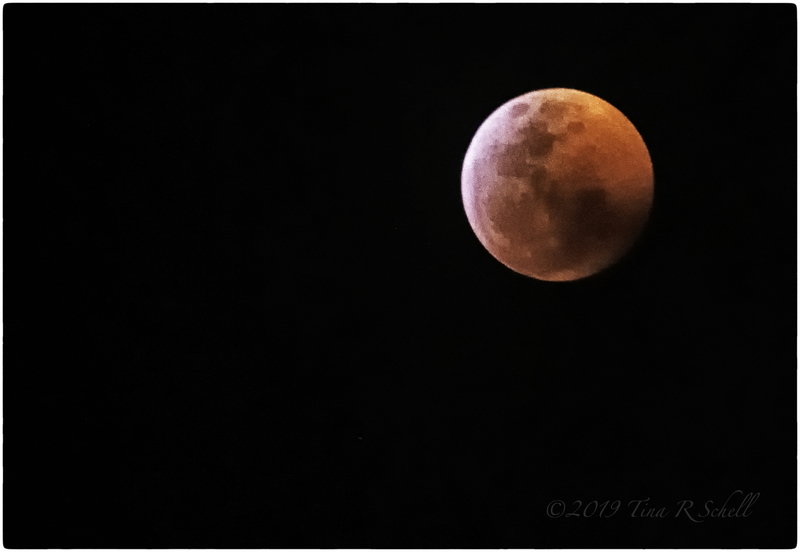 We had clouds during the eclipse, but I managed to capture the moon early the next morning! Well, a pretty steady face actually Pauline LOL. I was lying down on my porch with the camera leaning on my eye. Simply incredible…both the photos and the phenomenon of nature! Thanks Laurel – have to give credit to the phenom much more than the photos! I love looking at the moon and your images are stunning. Amazing, Tina. Without a tripod too!! So are you selling your Nikon now??? Gonna try. Wish me luck!! and the different takes on the special moon made for a nice flowing post. I was waiting patiently to see what you captured—You never disappoint T…. These are gorgeous! You’re too kind Diane but I’ll graciously accept your lovely compliment! Beautiful post, Tina. Please don’t tell me you are giving up on Nikon…. I recently invested in the D850… you have been inspiration over the years. Thanks Jane. I love the Nikon but just cannot steady it with the 70-200, my always favorite lens 😢. I’ll be watching the z series tho! Beautiful shots, Tina. Your rising moon landscapes are lovely. Amazing you got the blood moon reasonably clear without a tripod. It’s an amazing thing to witness, isn’t it? Beautiful shot of the red-colored moon! I’m jealous. Our usually cloudless skies were overcast that night so no photos for me. 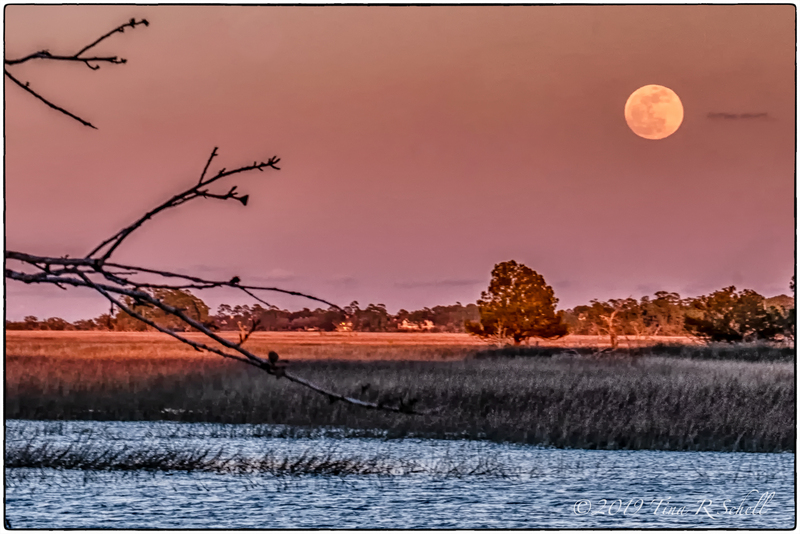 Never give up with your lenses, Tina, for I am always surprised with joy especially the moon rising over the marsh. I love the moon in any shape of the day. Your marvelous moonrise is just that. Marvelous plus! Love love love these photos! I, too, envy you could spend that precious time with fellow photographers. It wasn’t cold there, right? It was very cold here. It was so cold that both of our cameras quit working right before the best moment. Oh well… Still, comparing to those who didn’t see the moon at all, we felt lucky. You captured the moon in all its amazing glory that night. The size of it alone! Amazing and wonderful – and a gorgeous shot without tripod! I can understand it was totally unexpected to work out that well. I have tried shooting that red moon handheld, but never succeeded. Surely you must have a steady hand too, Tina! And I quite envy you having fellow photographers close on such an occasion out there in the marshes – must be some feeling! You do live in a beautiful and remarkable area. A nature lover’s dream. Does this mean you have left your Nikon altogether? I don’t know about the market for used cameras, but the fact that it once belonged to you ;-D might help? In Sweden I guess some sort of signature or marking would have raised the price. Fuji seems very popular today, and it is a fantastic camera. Ooh, thanks for showing these images, Tina….it was very cloudy here, so no sighting for me. Marvellous images, a 200mm lens on the XT2 equates to 400mm full frame, yes? More like 350 mm but so very croppable because the file size is quite large. Thanks Sue, glad you enjoyed these. We got kind of skunked on the solar eclipse so really appreciated the clear skies this time. Sounds good! What sort of file size? Oh, wow, so it’s full frame? Oh, OK…my little Olympus is a micro four thirds, and has approx 14MP, way less! Lovely captures of the moon.